The Build 2020 Team knows that many of our members and friends have questions about what’s happening with our upcoming renovations. Here are some that folks have asked, and our current answers. I’m new to UUCW. What are we planning to do to the building, and why? First, welcome! 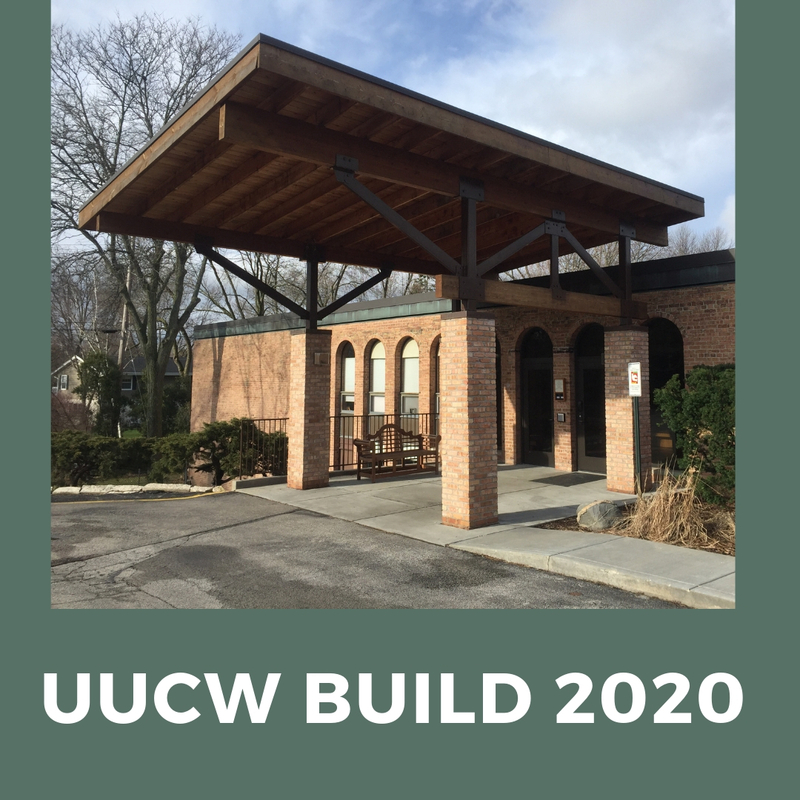 The current project, Build 2020, is an outgrowth of important facility needs identified in the UUCW Vision 2020 Long Range Plan. Funds for the project were raised during the 5-year Build 2020 Capital Campaign that began in early 2017. The three main goals of the capital campaign were to take care of major system maintenance (HVAC system upgrades, roof repair, parking lot reconstruction, energy efficiency improvements, technology upgrades), improve accessibility throughout the building (elevator to all levels, gender-inclusive accessible restrooms), and create suitable offices for UUCW staff. With sufficient funding, additional goals were to also create a more welcoming atmosphere in the foyer and community room that included a main floor library/café, revitalize the religious education and preschool space and redevelop the West Entry. Who is our architect? How can I find out more? Why is the Build 2020 project taking so long? When will we see plans or architect’s renderings? A project of this size is complex. The design process involves six steps with building evaluation, space program development, schematic design, design development, and preparation of construction plans all necessary before construction begins. Over the summer PRA conducted an evaluation of our building and property and produced a comprehensive facility assessment that will guide this and future church building and maintenance projects. Interviews were also conducted to determine the space needs of our congregation. This fall, all of this information, as well as information in the Holistic Study prepared by Workshop Architects and priorities developed for the Build 2020 Capital Campaign, was used to prepare a preliminary design. The projected construction cost to complete this design was prepared by Berghammer and recently presented to the task force. Once the final budget is determined the design will be completed and presented to the congregation, and this will likely occur in January or February 2019. I hear that we haven’t raised enough money to do all the things we want for the building; is that true? While the final budget for the project has not yet been approved, we did not raise enough money to complete all of the projects outlined in the Build 2020 Capital Campaign. For example, we learned that it would take nearly $1.2 million, the entire amount raised in the capital campaign, to complete just the deficiencies identified in the facility assessment completed by PRA. Even after the task force reprioritized the maintenance projects and certain aspects of the remodeling, such as the elimination of redesign of the West Entry and remodeling of the lower level, Berghammer’s initial budget projection is that our project will cost $1.6 million. That price includes about $200,000 for an elevator, an important priority, but it does not include the cost of new furniture and appliances, estimated to be at least $50,000 – $100,000. The task force is currently working with PRA and Berghammer to develop a design that will fit our budget yet meet as many or our priorities as possible. Can I still make a pledge to the capital fund to help pay for the renovations? Of course! It is never too late to make a new pledge or to add to an existing pledge. In fact, pledges made now are especially timely as the task force is in the process of reevaluating our priorities and finalizing a budget recommendation for the Board of Trustees. All pledges are welcome, of course, but if you have an interest in funding a significant portion of a priority especially important to you contact Leslie Peterson for more information. Contact Leslie also if you are in a construction/remodeling related business and you are interested in donating materials to the project at reduced cost. All contributions will help complete as many priorities as possible. Under the current timeline, construction will start in May or June 2019 and continue through the summer. The project is projected to take 3-4 months to complete. There will be constant communication with the congregation during construction, and extensive planning will take place to minimize the disruption to regular activities at UUCW. If you have other questions contact Phil Kroner, Chair of the Build 2020 Task Force, or any of the other task force members: Kathy Bradshaw, Pat Kashmerick, Leslie Peterson, Rob Zimmerman, Dennis Wanless, Almuth Soffee, Mike Brown, Vicki Banville, and Rev. Suzelle Lynch.